Simply enter the coupon code COU0666939 as you check out an order – valid for deliveries from Wednesday 27th August to Friday 5th September. We’ll add the item to your trolley and deduct the cost from the total for the first 1,000 customers. 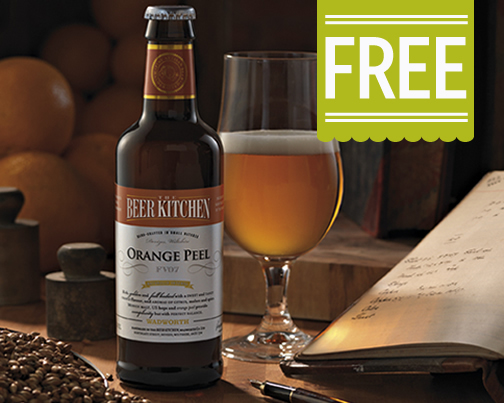 This entry was posted in Freebies, Talking Ocado and tagged free, freebie, giveaway, Groceries, Ocado, Ocado deliveries, Ocado groceries, Ocado Vouchers, ocado.com, Orange Peel Ale, Shopping at Ocado, The Beer Kitchen, Voucher by Ocado. Bookmark the permalink. Hi Amanda, thanks for your comment, there’s a slight typo in the code there. The correct code is: COU0666939. We’re just amending the blog post too! The voucher code is incorrect and not recognised when you check out. Hi Lidia, apologies that you weren’t able to redeem first time, the correct code is: COU0666939 and the blog post has now been updated. Hope you enjoy the beer!